with nothing in the night watch to watch over. if there’s no one in ear shot of the impact? unimpeded by shield or screen)? thinking of never again having cause to bow down. 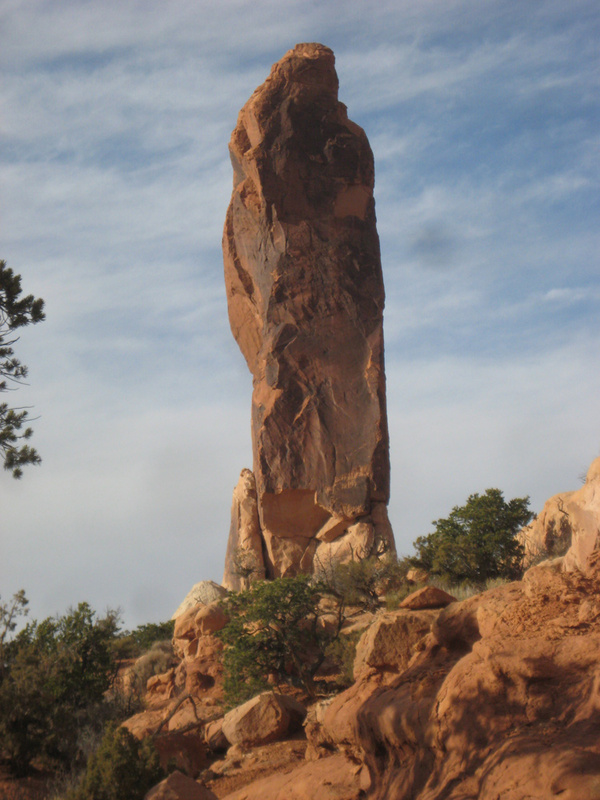 Climbing Dark Angel continues my series of poems inspired by famous sandstone formations in Arches National Monument, a project which aims to reflect on the nature of human becoming by exploring rich metaphors that these formations (and their colorful names) offer. This poem explores the dark side of rejecting community, thinking of the daring rock climber who prefers to scale the cliff wall alone. In Biblical imagery the "dark angel" conjures up Satan, the beautiful angel who preferred autonomy to submission in God's glorious company (Better to reign in hell than to serve in heaven, says Satan in Milton's Paradise Lost). The poem also alludes to the infamous Tower of Babel (Genesis 11) which also serves as a symbol of the allure and the curse of seeking independence, of relishing the thought of never having to bow to anyone or anything. The results of such independence are not all they are cracked up to be (pun intended! ).